The one thing that Easterly hammered over and over in his book (in a nice way) was that people respond to incentives. He proposed that the reason countries in the tropics had not significantly increased their wealth was that the developed countries were providing tropical countries the wrong incentive(s) to improve. 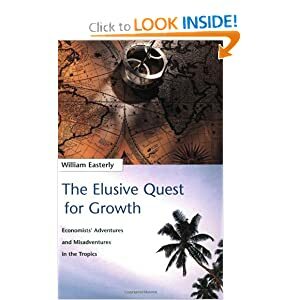 Easterly talked through population control, education initiatives, technology implementations, corruption cleanup and numerous other ways economists thought would provide incentives for countries in the tropical region to improve the lives of their citizens, all of which failed to reach their goals. None of the ways in which economists believed would foster growth led to anything more than a temporary reshuffling of the deck of poverty cards. Economists never gave the people and governments of tropical countries reasons that would make the inhabitants want growth. As project people, we must constantly be looking for ways to engage and enable our customers to better themselves. If at the end of the project, we don't walk away with an improvement of some kind that outweighs the cost, we need to ask ourselves if there was really a need for that project. We must find and build a case for why the incentives will work to bring about the change needed in the organization. The next lesson to learn from Easterly is that there is no magic bullet to solving a problem. Economists looked for years to find the right way to bring prosperity to the peoples of the tropical countries, only to find that there is no right way (although there are many wrong ways). Its the same with being a business analyst. There are adherents to traditional waterfall, to Agile, to SCRUM or whatever methodology of the month happens to have captured the fancy of some executive. No particular methodology is a substitute for possessing the skills, knowledge and experience of a quality business analyst. Knowing how to create the most accurate and detailed process map ever seen, yet being unable to explain that map to a customer is as much a recipe for failure as not knowing how to create the map in the first place. Sometimes, being behind the curve is really being ahead of the curve. Easterly discusses how countries that are very far behind the technology curve often find it easier to catch up than those who are much further along (but still behind) the cutting edge. The large investment in new infrastructure requires a payback period in order to be a good investment. If there is no initial infrastructure, creating from a new slate can be easier because there is no owner of existing infrastructure who sees his or her livelihood being taken away. The same goes for projects. Companies that have never had structured processes or enterprise systems have often just made due with whatever paper or Excel documents they can create ad hoc. Giving these groups any sort of system or any standardized process can seem to be a god-send into their life of chaos and disorder. Contrast that with trying to implement a new system into an environment that has had a system, even if that existing system fails to meet fundamental needs, and you'll see what its like when real chaos ensues. Its not just the old 'people fear change' metaphor at work, but the investment of time, money and knowledge in an old system or process can be a very large roadblock that must be removed before the new can replace it. The final lesson I'll highlight is that there are many ways to kill growth. Easterly discusses how closed economies, stifling governments and repressive banking policies will keep poor countries poor. These things are not only caused by ignorance on the part of those in power, but often by corruption and greed. In projects, we deal with the same type of power brokers (usually on a much smaller and more petty scale), but to many people in power, any hint of change is a threat to their base of power. As analysts, we must always be mindful that our stakeholders do not always have the best interest of the project, the company or themselves at heart. What they may see as the right path could be horribly detrimental to everyone involved. It is our job to find out why these individuals are behaving in such a manner and to diffuse their disruptive and destructive behavior. I highly recommend you picking up Easterly's relatively small book. It is a quick and engaging read, even if the subject is economics. If you're like me and love vacationing in the tropics, you'll come away with a new appreciation for the plight of the citizens who live in such beautiful locales. If you read it with an eye toward business analysis, you'll come away with lessons that will guide you through the rest of your career. It is my first time I visited your blog same as carpet protective film. you know what I also read that book. the content is great.